We're happy to offer this 1894 $10 Liberty Head Gold Eagle Coin NGC MS 63 here at Bullion Exchanges. 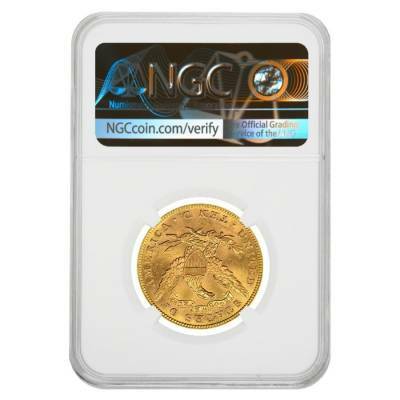 The coin comes graded by NGC as Mint State 63. 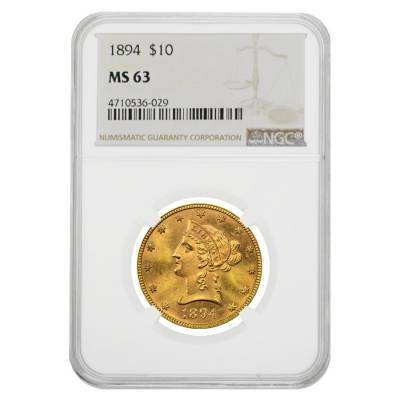 The obverse features a bust of Lady Liberty, crowned with her "LIBERTY" tiara and with a loose hairstyle. Encircling the rim are 13 stars, each representing one the of the original colonies along with the year of mintage. The reverse displays the US Navy Seal, which consists of the American Eagle with a patriotic shield on its chest. Inscribed below is the denomination. For every $1 spend, you will earn 1 Bullionaire Buck which is equivalent to $0.001 off a future purchase. 771 BB = $0.77.